Downriver from the ancient village of Coyote's Paw is Copco Lake. The dam that created the lake in 1922 is being removed and the Klamath River restored to its original channel. Perhaps long-buried villages and other sites will emerge from the lake-bottom muck, also revealing a stretch of the Old Time Indian trail that once ran the entire length of the river, from Upper Klamath Lake to the coast. We'll see what happens! 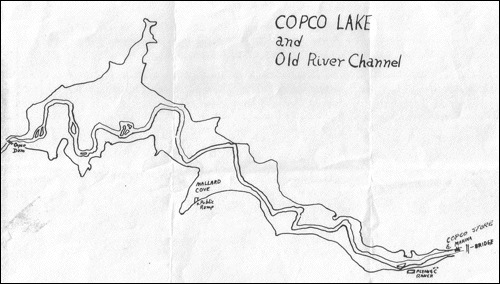 This map shows the old river channel within the current expanse of Copco Lake.